Applegreen Websites normally does this job for its clients. But I case you're going it alone, here's how to start. 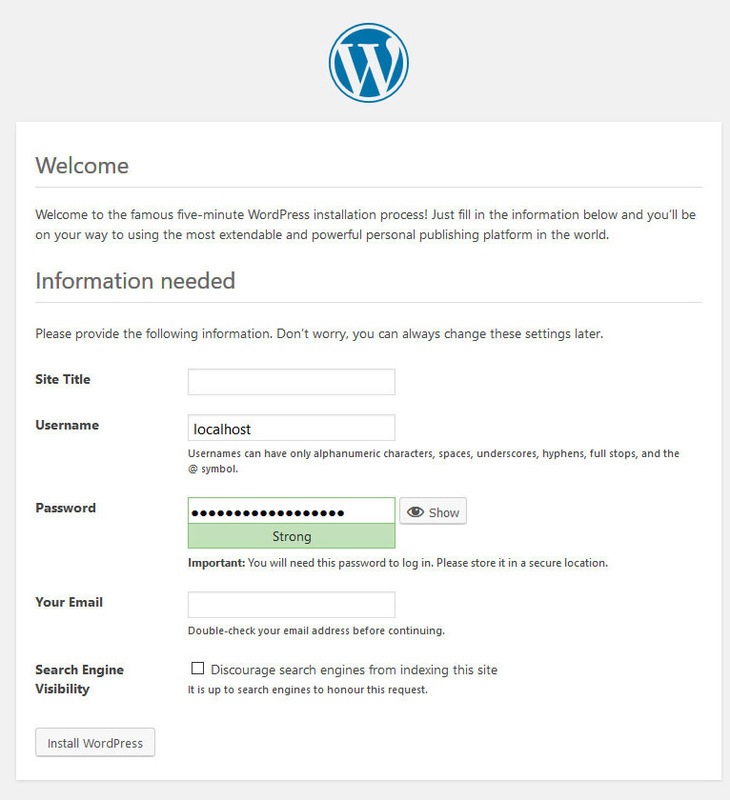 WordPress needs Linux hosting and one database, placed on your own domain: those are the minimum requirements for installation. Most hosting companies offer a one-click install which downloads the files and manages the database connection for you, so you don't have to worry about that. They may ask you to choose between plain and managed WordPress hosting: plain hosting is sufficient if you are paying a designer (such as Applegreen Websites). 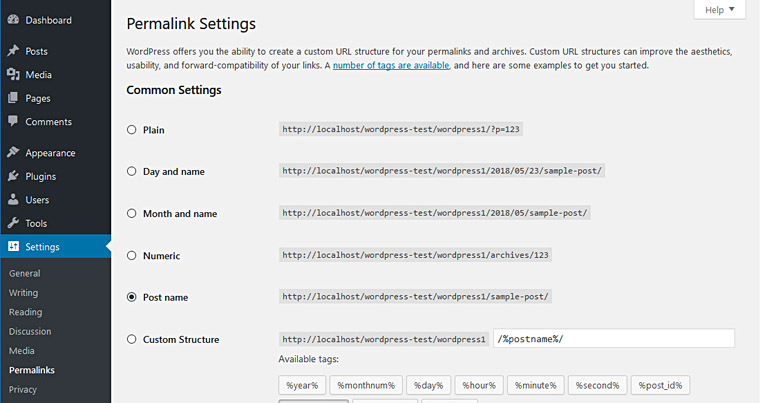 Managed hosting usually handles updates and caching for your and offers a wider choice of themes and plugins. Check the differences and pricing, they vary with the hosting company. The screenshots below are taken from a sample installation on the local server of our computer, so there may be some variations, but the general principles are the same. You will reach this screen immediately after you launch the one-click install. 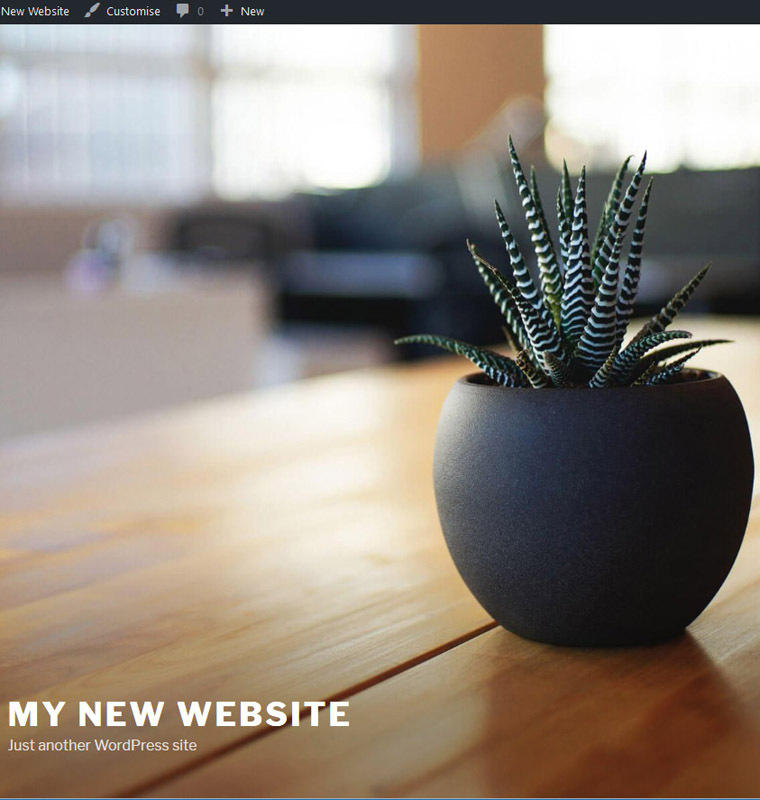 Fill in the site title (name of your website, you can change it later). The username and password you set here are those you will use to log into the editing side (Dashboard) each time you want to update the site. Replace "localhost" with your chosen username. Click "show password" so you can see what is being suggested and copy your password and username to a safe location. 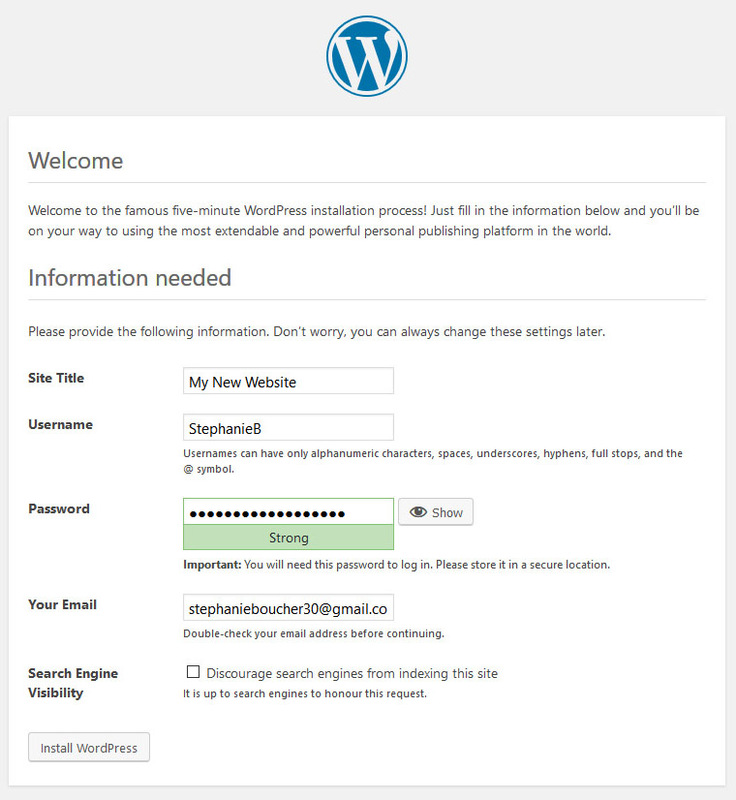 Add your email and click "Install WordPress". Don't discourage search engines from indexing your site unless you have a good reason for doing so. When you have done this, click the Log In button to reach the login screen. You're in. Here is the Dashboard: all your editing starts here. To visit the website itself, click on the name you gave your site, in this case My New Website. 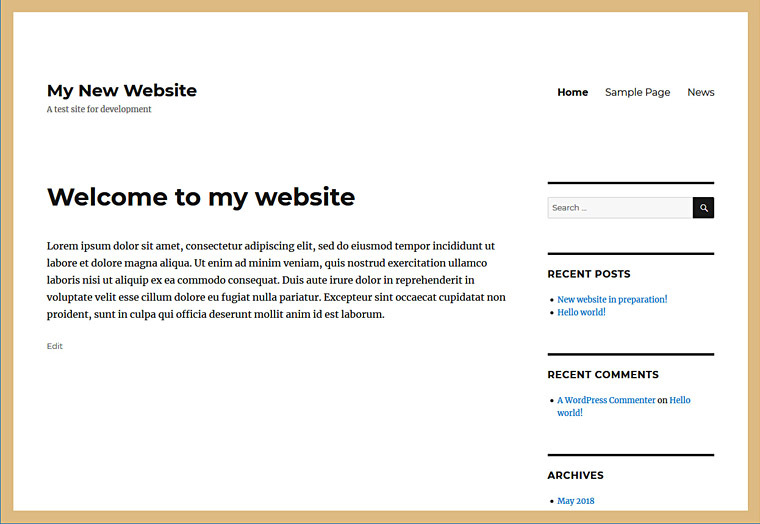 The front end of your new website, which the public will see! 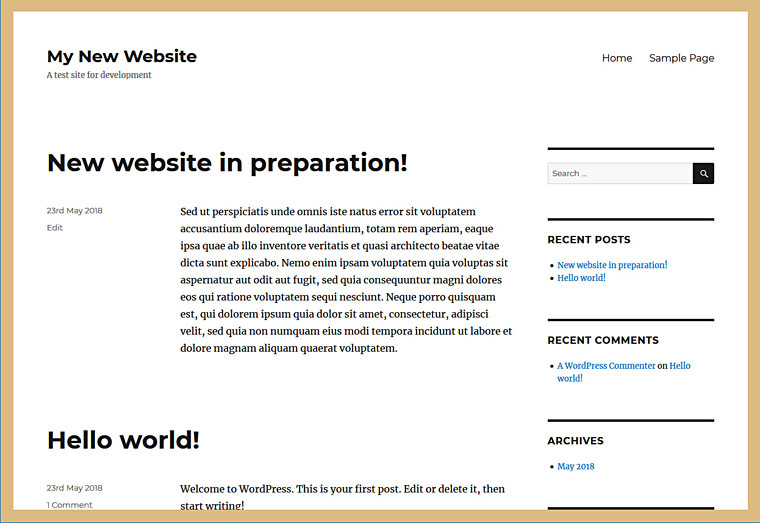 The site title we chose earlier is shown, together with a standard WordPress tagline. We will see later on how to change these. 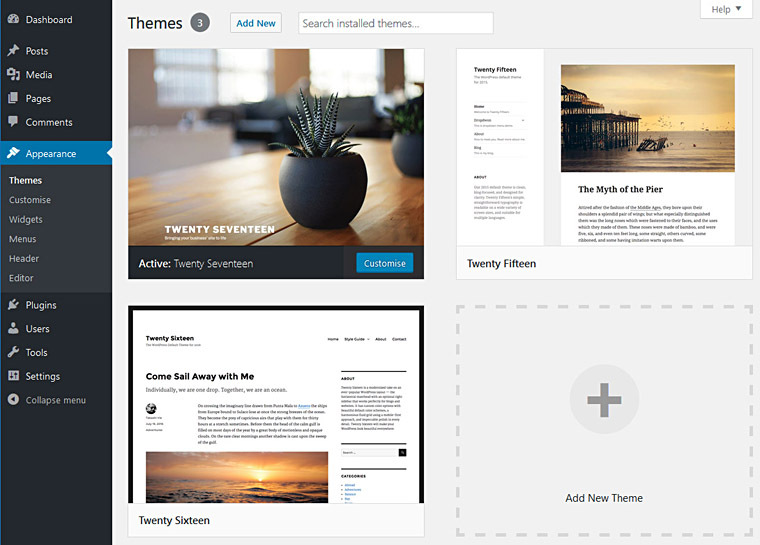 The website is running one of WordPress's native themes called Twentyseventeen (we will also look at themes later on). 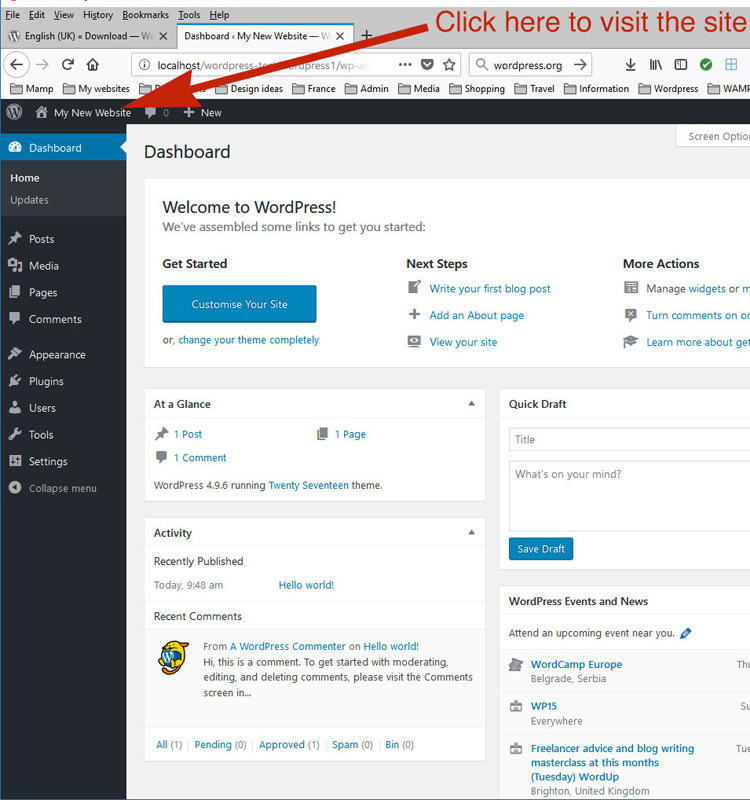 To get back to the Dashboard, click on the downward arrow on the bottom right to get to the website's main content. In the sidebar under META, click on Site Admin to return to the Dashboard. 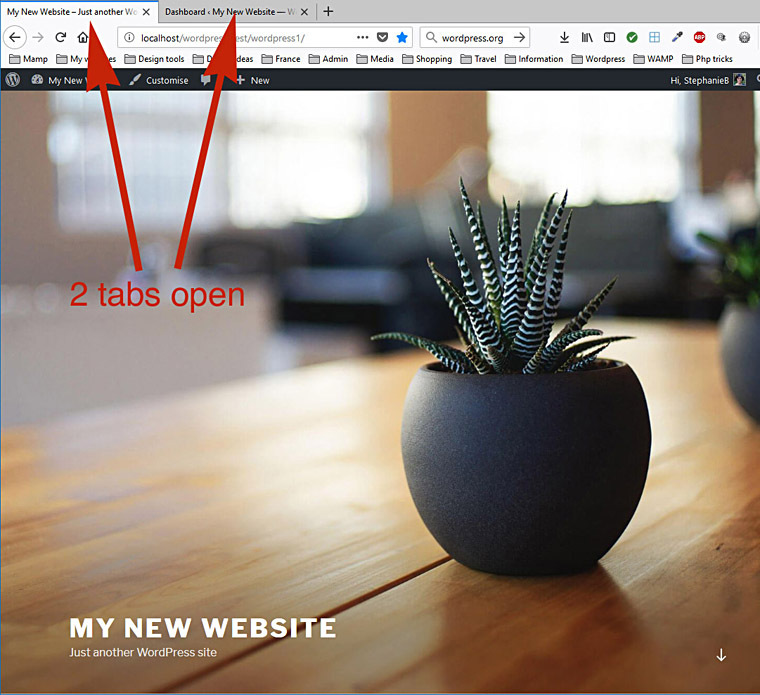 We recommend that you keep the front end and the Dashboard open at the same time in two different tabs. Each time you save the changes you have made to the back end, go to the front end and refresh the page to make the changes visible. Bookmark both the website and its admin page so you can return to them easily in future. First, let's head to the Settings tab on the Dashboard. Clicking it opens up seven sub-tabs: General, Writing, Reading, Discussion, Media, Permalinks and a new one called Privacy. Most of these titles don't mean much in practice so we'll explain them. Under General Settings, you'll find the name you're given your website, along with the tagline. You can change both of these. I recommend leaving the other things alone, but you will want to set your languate and time zone. 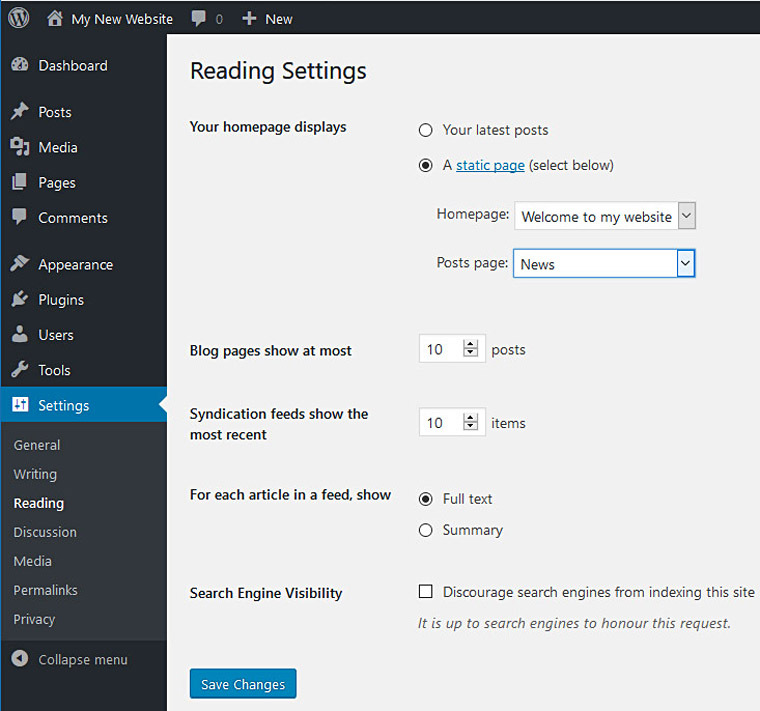 The Writing Settings allow you to change default categories, something you only need for a blog or news page. Under Reading Settings you can choose your home page, assuming you've created a couple of pages already. WordPress began life as a blogging platform and by default, it creates the blog page as your home page. You may not want this. Here you can choose a non-blog or "static" page instead. 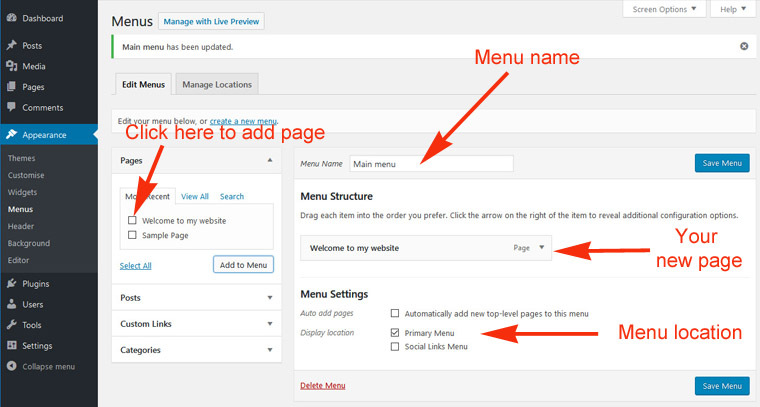 If you want a blog page (you can use it for news, events or proper blogging), this setting allows you to select it (assuming it has been created), but even then it doesn't have to be your home page. 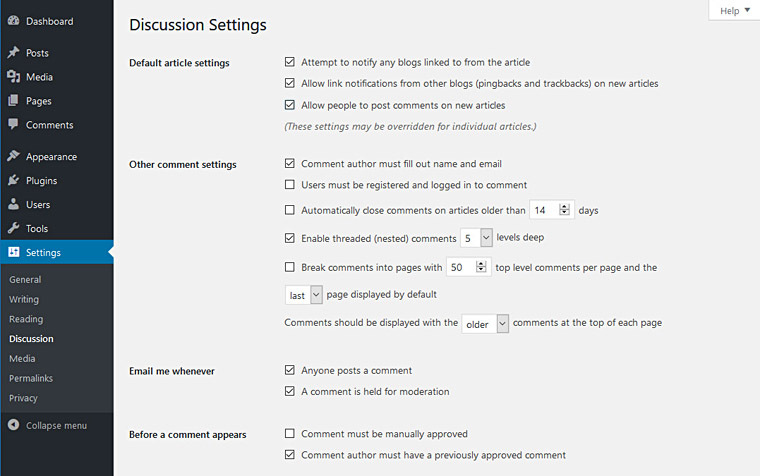 Again, unless you plan to run a lively blog with comments (which you have to moderate), you will use this page to turn off the box that says "Allow people to post comments on new articles". 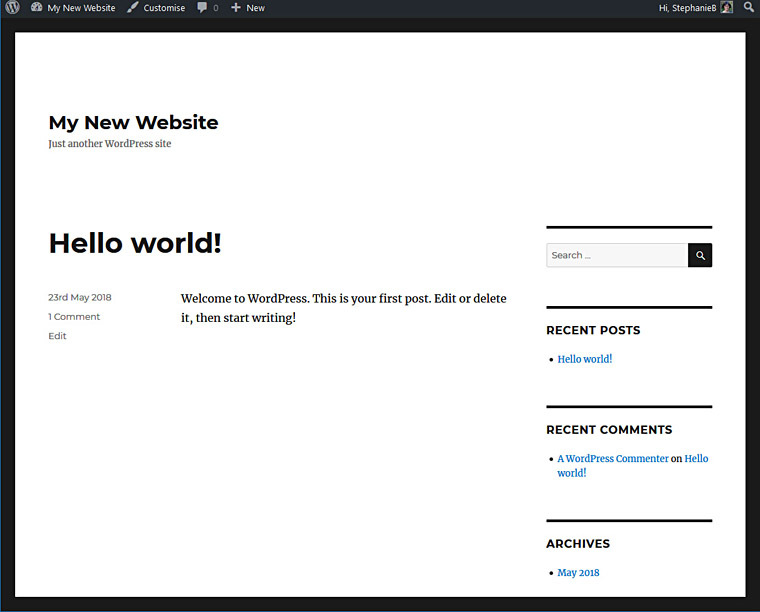 If WordPress has loaded a sample post for you (called "Hello World! "), delete it. The Permalinks settings allows you to match the url (web address) of your blog posts to their titles, so that they rank for search engines. 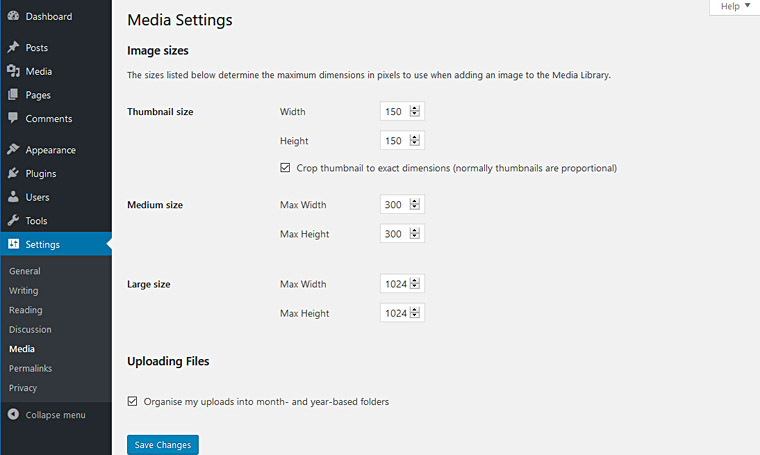 The only Media setting we change is to remove the website's ability to create month and year folders for images, unless you plan to upload hundreds. 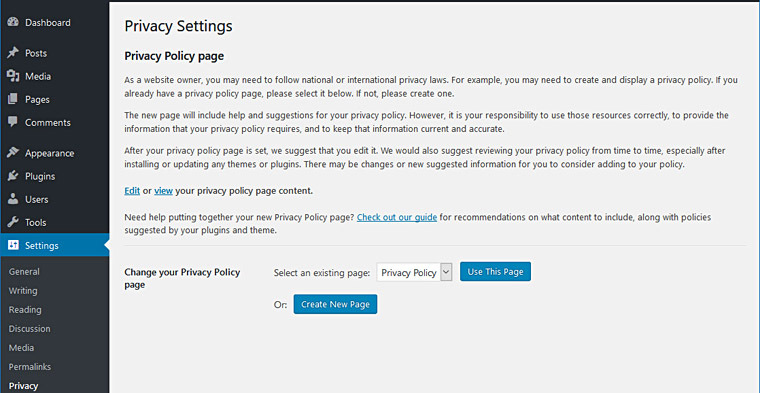 The Privacy setting allows you to choose a sample privacy page, or create your own. The theme governs the looks of your site, and to some extent its functionality. 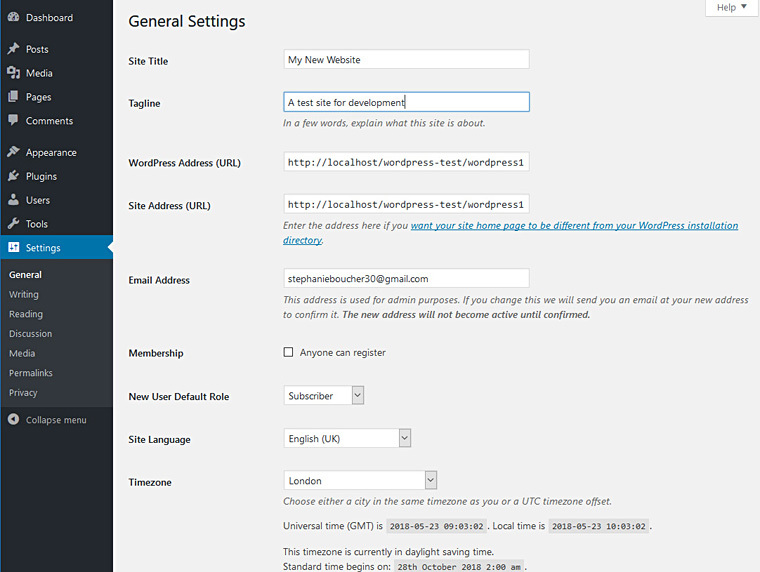 WordPress comes with three native themes. By default, the most recent is activated: the current theme is called Twentyseventeen. That is what you will see on installation. Want an example of a website with Twentyseventeen? See Curlew Cottage. You can choose another by clicking on Appearances in the Dashboard. Click on another theme and activate. We are going to switch to Twentysixteen and customise it a bit. Twentysixteen is very plain but that also makes it very versatile. For examples of websites in which we have used Twentysixteen see Marian Robertson Music and Abelia Handbags. Some of these adaptations are specialist work carried out by Applegreen Websites. But Twentysixteen provides a handy Customiser which gives some options over its appearance. The Customiser is accessed under the Appearances tab in the Dashboard. See the finished result below. 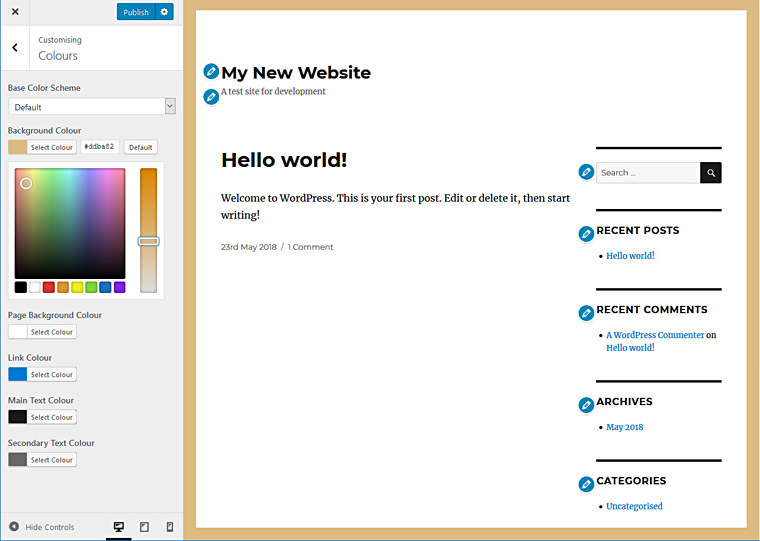 Now we will create a new page, add it to the navigation and make the navigation visible. In the Dashboard click on Pages > Add New. Give your page a title and some content, then click the Publish button on the right. That's it. But where is your new page on the front end? You won't see until you add it to the main navigation. Most themes expect you to do this manually, under Appearances > Menus. On this screen you can create a menu and give it a name, then add your new page (it will be listed on the left under Pages, just tick the box next to it and click Add to Menu). 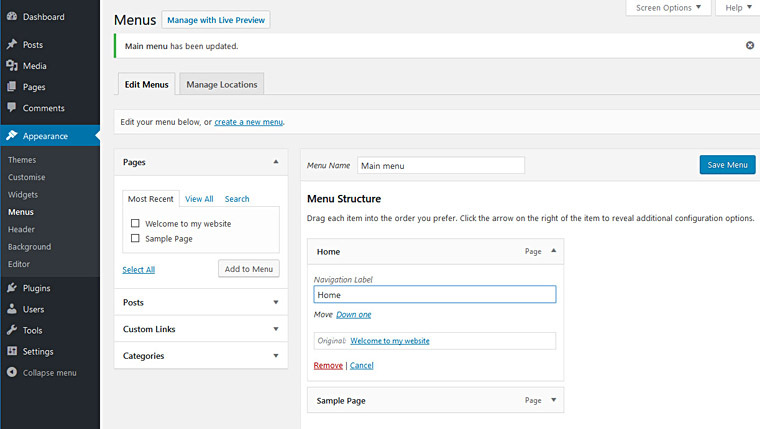 The screenshot shows the page already added, un the right under menu structure. Under Menu Settings, choose the location in the theme set aside for this menu, in this case Primary Menu, and click Save Menu. Menu items can be dragged up and down to change their order, or sideways to add them as sub-items, creating a drop-down menu. How the front page shows two menu items in the navigation, top right. But there's a problem: the page title we chose for our new page, Welcome to my Website, has become that page's navigational label, and that's rather cumbersome. Let's see how we can change it. Back on the menu screen, click on the page item whose label you want to change. Type your chosen label, eg Home, in the box marked Navigational Label, and save the menu. Refresh the front end, and there is your new label, Home. Our website still has its blog page as home page. We'll leave it like that for now and create a blog post. 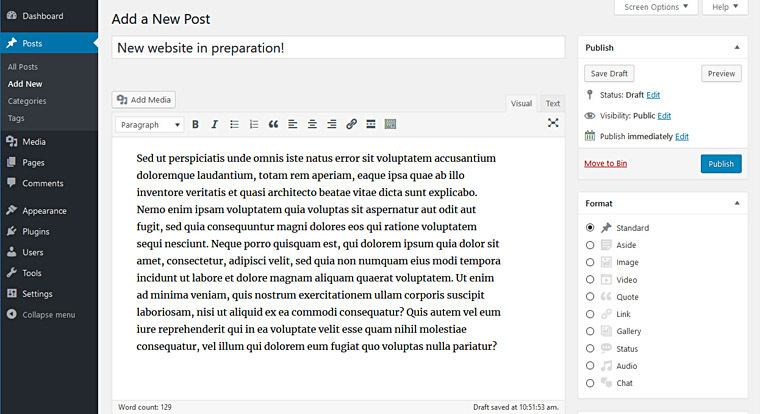 Posts appear on your blog page stacked on top of one another, with the most recent at the top by default. The editing screen is the same as for Pages. Click on Posts > Add New. Add a title (New website in preparation!) and some content, and hit Publish. Check the front end, and there it is. 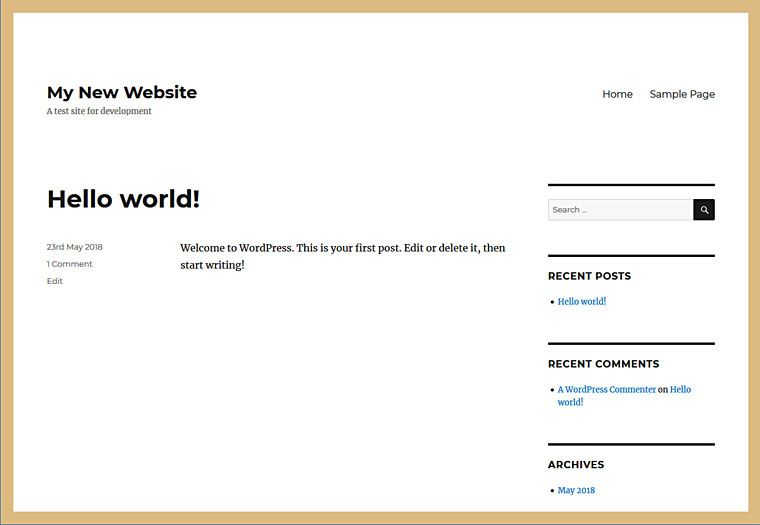 The new post appears above the default one added by WordPress, Hello World (which you should delete eventually). Not only that, its title appears in the right sidebar under Recent Posts. Twentysixteen provides a sidebar space for widgets, and each of the elements between the thick black lines is a separate widget: Search, Recent Posts, Recent Comments, etc. You can access the widgets under Appearance > Widgets, dragging and dropping to add and remove. So you don't want the blog page to appear first when people go to your website. Here's how we choose the page we do want them to see first. 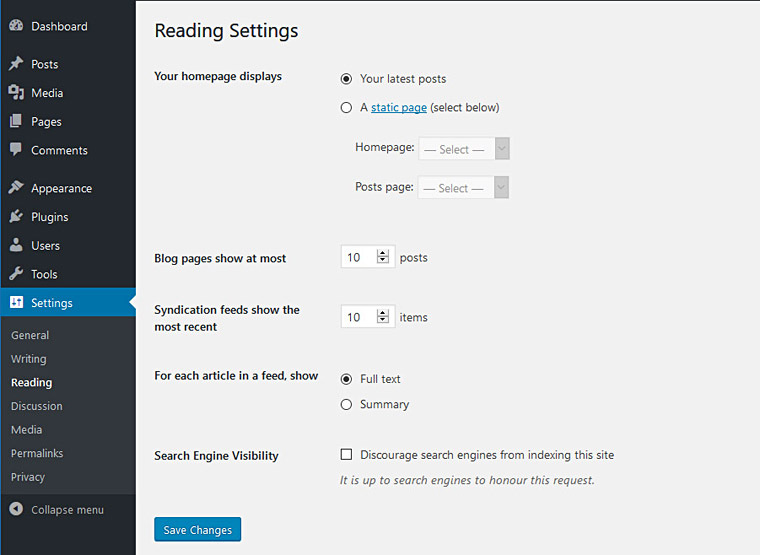 Go to Settings > Reading: under Your Home Page Displays, you have a choice of Your latest posts or A static page. 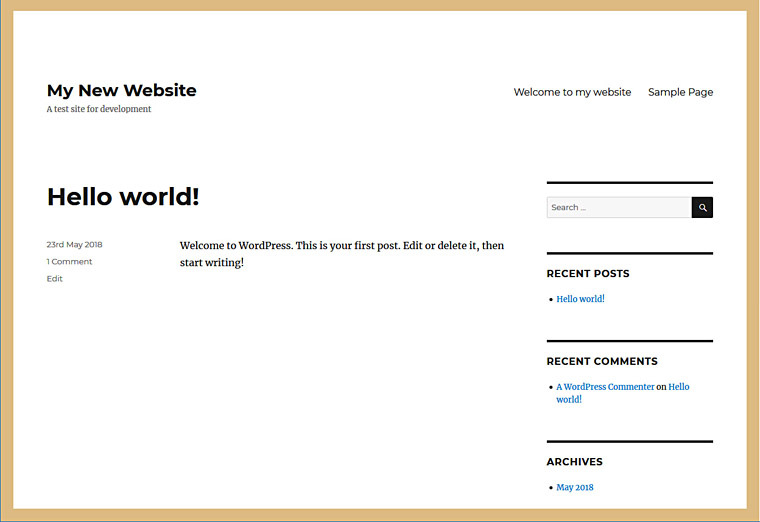 Here we have chosen the page entitled Welcome to my website (whose navigational label is, conveniently, Home). And there it is: Welcome to my website, navigational label Home. Twentysixteen preseves the widgetised sidebar on static pages — themes vary in this. There is plenty more you can do, see below. On the Widgets page, the list on the right indicates which are active where on the theme. The list on the left indicates available widgets. Drag and drop to add or remove. 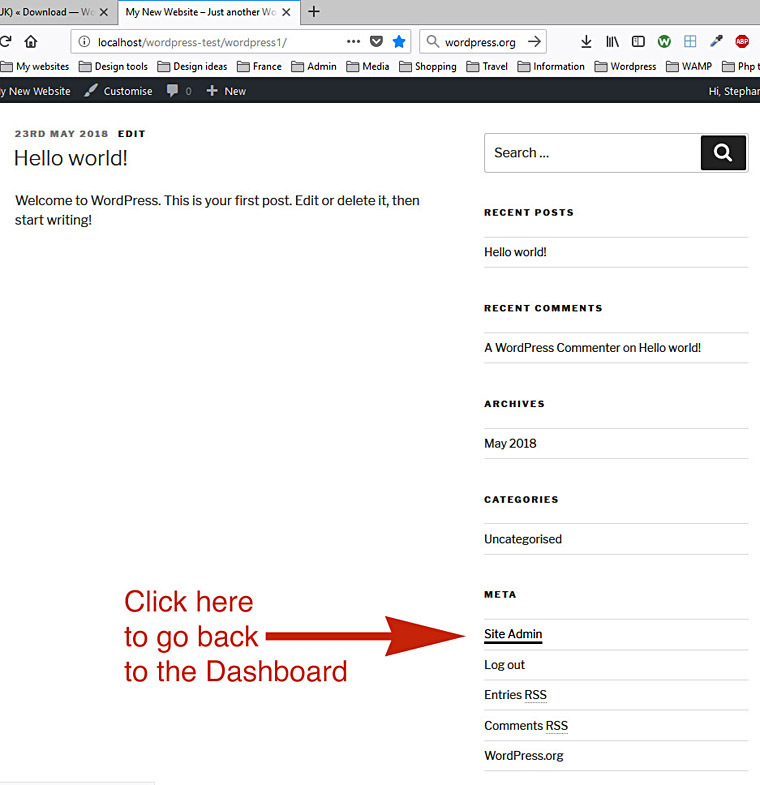 WordPress and any theme and plugins you are using must be kept updated: the Dashboard will notify you when this is needed. Updates they matter for both security and functionality. Paid themes and plugins are subscription-based — your subscription ensures regular updates. Have fun, and contact us if you have further requirements!